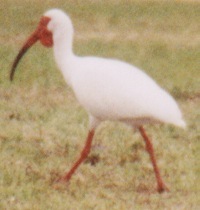 White Ibises are wading birds found throughout Florida. All are in breeding plumage (red bill, face, and legs). Note the inflated gular pouch on the male to the right.